A Google search for childhood obesity brings up over three million sites. Whew! I guess there is a problem. The CDC reports that this monster has tripled in the last 30 years. In 1980 only seven percent of children aged 6-11 were obese. In 2010, nearly 20% reached obesity. 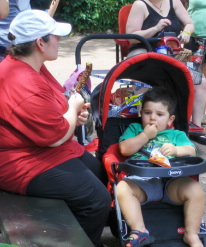 In 2012 about a third of all children are overweight or obese. Why? Little exercise, fast food, too much food, and foods high in saturated fats. Another, more subtle, reason is that their role models – parents, relatives, and the people they watch on television – are fat. Kids figure that it must be OK to be overweight if everyone else is. For the first time in a century, the youngest generations are predicted to have a shorter lifespan than the current older generations. Disheartening, huh? Unfortunately all the attempts by the media and well-meaning school administrators don’t seem to be working. Childhood obesity is growing. In 2011 county officials in the Cleveland, Ohio, area took an eight-year-old from his mother and placed him in foster care since his mom was not doing much about her kid’s morbid obesity, even though case workers had counseled her for a year on this. An average eight-year-old weighs about 50 pounds. This child weighed 218 pounds and had breathing problems and sleep apnea. And the mom was upset since she said the county “over-reacted.” Yes, our role models have problems. Good for Cuyahoga County officials – they may have saved this child’s life. So, why will the LifeNuts program work when all other programs are failing to stop this epidemic? LifeNuts will work because it is a community-wide program where everybody (who participates) becomes involved and because annual measurements hold participants accountable. If parents, teachers, neighbors, the local television news anchors, the mayor, and the city councilmen and women lose weight and become fitter, kids will notice. Once the city begins to change its eating and exercising lifestyle and learns stress management skills, the community atmosphere will change. Kids hate to be told to do something but they like being a part of something.